The Sun is offset from the local mean Galactic plane towards the North Galactic Pole. 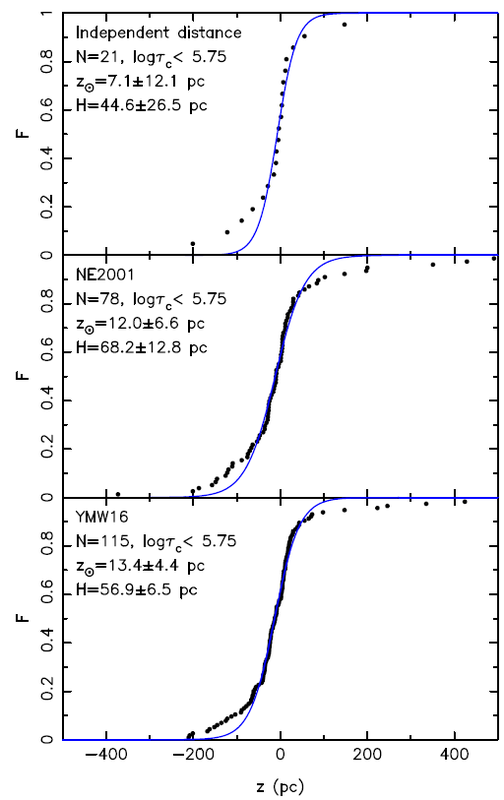 In the earlier research, Sun’s offset is often obtained by fitting a function to the observed z-distribution of H II regions, OB stars and open clusters. Based on pulsar distances, including model distances (estimated by NE2001 and YMW16) and model independent distances, the z-distribution of young pulsars can be used to analyze the scale height (H) of the young pulsars and to estimate Sun’s offset from the local mean Galactic plane. This work was supported by Prof. R. N. Manchester from Australian Astronomical Observatory and Dr. Na Wang from Xinjiang Astronomical Observatory.